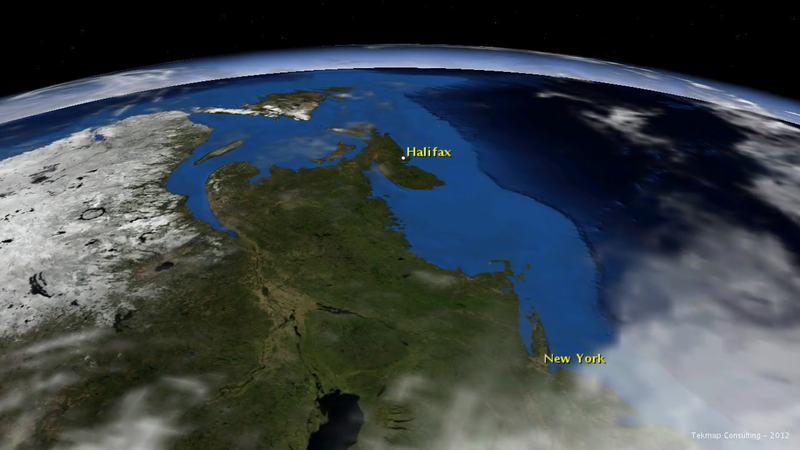 A recent episode of CBC's Land and Sea featured a 3D fly-through created by Tekmap Consulting. The 3D fly-through was included in Season 2016 Tidar Power episode 17. The episode covers "the latest efforts to harness tidal power in the Bay of Fundy". The clip used in the episode is from an animation created for the Fundy Ocean Research Center for Energy (FORCE). The animation was created with custom software developed by Tekmap Consulting. The software is built upon the NASA World Wind software development kit (SDK). Using the custom software, Tekmap was able to combine several disparate datasets over the study area. A full description of the FORCE video can be found in the Tekmap article "Fly-Through: Bay of Fundy FORCE Test Site". The full video can be viewed in our movie gallery, the FORCE Vimeo channel, and at the FORCE Visitor Center. A public access kiosk used at the Beford Institute of Oceanography. EarthNav Lite, a desktop application used to view, manage, and visualize high resolution data. A key-frame animation application used to create the custom fly-through animations, including the one featured on Land and Sea.